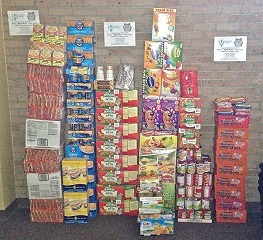 Children attending Vacation Bible School at First United Methodist Church in Denham Springs in late June collected food items for “Mighty Moms,” a community grassroots effort focusing on feeding hungry children in Livingston Parish. “The Mighty Moms initiative has been featured on local TV and in The Advocate. First UMC has adopted this ministry as part of our missions efforts and part of our offering target for the Bishop’s ‘Bless the Children’ initiative as pledged during the 2013 Annual Conference,” said Rev. Ginny Allen, associate minister for First UMC.